At Montessori Leaders children are provided the warmth of the daycare with the best education to prepare them for life. The students are in groups of 8 to10 children with every teacher. 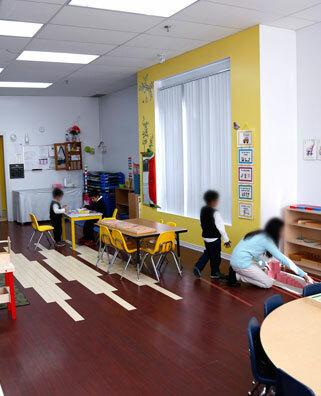 There is certified Montessori and/or qualified teacher in every classroom working with the children. The program is tailored to improving the children’s intelligence and capabilities using the proper Montessori tools. The program develops Math and language (English/French/Spanish) skills. Playground time brings vitality and happiness to the students (if weather permits). The professional gym time develops children’s motor skills. Full Day (School time): from 9:00AM to 3:00PM, Monday through Friday (for all ages 5 days/Week). Half Day: 9:00 AM to 11:45 AM, OR 12:15 PM to 3:00 PM (pre-school). Meals menu to choose from (to be provided).